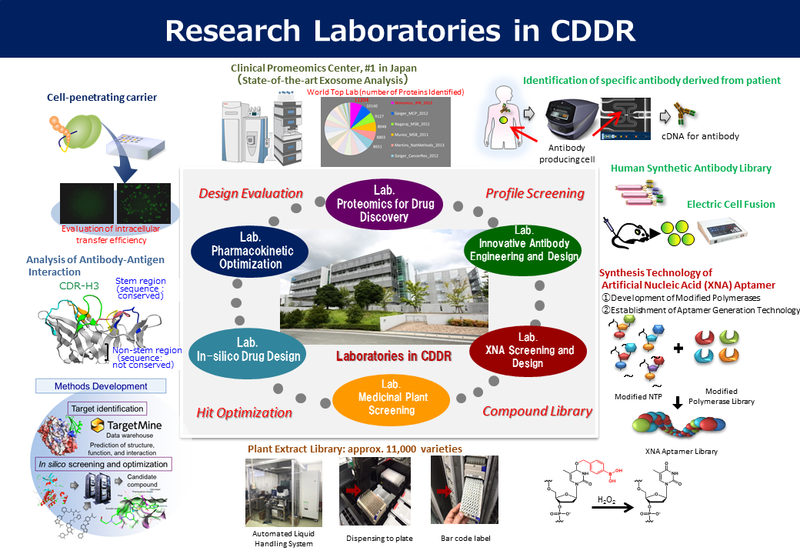 The Center for Drug Design Research (CDDR) focuses on research and development of new technologies relating to drug screening, in-silico design and pharmaceutical optimization in order to contribute to the development of innovative drugs, such as antibody, nucleic acid-based drugs or other new modalities. Utilizing every technology and resource established within this center, we also serves as a technical support core of the national project "Drug Discovery Support Network" that assists transitioning various drug seeds from academia to clinical applications. In recent medical drug development, not only small chemicals but also middle or high molecular weight drugs, such as biologics and nucleic acid drugs, are anticipated. However, because the theory of design for these new category of drugs have not been established well, various technologies for drug design are required. In this center, we are focusing on the research of such drug design technologies and contributing for innovative drug development. “Drug Discovery Support Network” is a national program to assist transitioning the seeds from academia to drug development. Our center is the technical support core of the above program assisting design and optimization of antibody drugs and nucleic acid drugs, in-silico drug design, medicinal plant library screening, and also providing various bioresources. We will assist the drug discovery via Drug Discovery Support Network and then contribute to the innovative drug development.